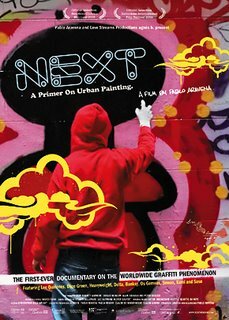 Now on to the show... DJ Mel's gonna be at the Alamo Drafthouse Downtown spinnin' for the reception of the screening of the film Next: A Primer On Urban Painting... RSVP for the event here... the show is free with a Q and A afterwards with the director Pablo Aravena. Here’s a stumper - if a graffiti artist takes can to canvas, not train car, and hangs it in a gallery, is it still graffiti? Even if the visual code of hip hop graf is intact, the hallowed laws of impermanence and reclaiming one’s turf have been compromised. So what do we call it now? “‘Post-graffiti’ is a term I could get comfortable with,” says local filmmaker Pablo Aravena. “Mind you, that’s what they called it in the early ’80s, when they started putting graf into galleries.” The working title of Aravena’s current documentary project is Next: A Primer on Urban Painting, suggesting another possible term for what the graf tradition has evolved into since its dawn in the Bronx almost three decades ago.